Zara Roberts (30) has been awarded the RYA Yachtmaster™ of the Year 2016 for her exceptional performance across all aspects of the examination. 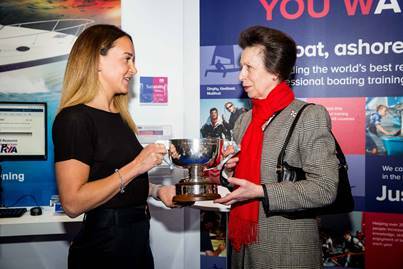 Zara, from Scarborough, was presented with the prestigious trophy by HRH The Princess Royal today [Wednesday, 11 January 2017] at the 63rd London Boat Show at ExCeL, London. She undertook her exam for RYA Yachtmaster™ Offshore for power vessels in May 2016 through RYA Training Centre “Quality Time” at Portland on the South Coast. The recipient of the prestigious Yachtmaster™ of the Year annual award must possess outstanding skills and knowledge as a skipper and will have successfully demonstrated their expertise and experience during their exam. But the sea was calling. Zara took her RYA Day Skipper exam, propelling her towards her next goal – the RYA Yachtmaster™ qualification. Still, she dug in and found the strength to perform at the highest level on all counts. David Gray, a long serving RYA examiner was so impressed that he nominated Zara for RYA Yachtmaster™ of the Year just a few days after having conducted her practical exam. David said that Zara demonstrated a very well rounded ability, excelling in all aspects of the exam - the theory, practical tasks and soft skills necessary for effective command. Speaking after the presentation on the RYA Stand [C009], Zara said: “Passing the Yachtmaster exam means the world to me. It was a really pivotal moment in my life. I thought I had done well, but the weather was awful and it was mentally taxing, so I had no idea I’d done that well. 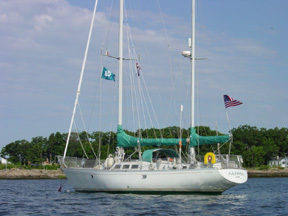 Nominations for the highly-respected award were put forward by the RYA’s worldwide team of RYA Yachtmaster™ examiners. In recognition of her achievement, Zara received the RYA Yachtmaster Trophy – donated by the Royal Institute of Navigation. The RYA Yachtmaster™ qualification itself is highly respected across the globe, and is a great entry ticket to the maritime industry. Click here to find out more about the Yachtmaster™ exam.